Don’t forget like my facebook page or join my facebook group to keep in touch with me. Also need square or rectangle cake tin and baking paper. 1. Grease cake tin (I used 23cm square cake tin) and add bread crumbs in it. 2. Preheat oven to 180˚C. 3. Take butter to room temperature. Using an electric mixer, beat butter and sugar in a large bowl. Beat it until sugar dissolve. 4. Add eggs and beat well. Add milk powder and cardamom powder. 5. Sift flour and baking powder together. 6. Add flour mixture over egg mixture and gently fold with a spoon until just combined. Pour batter into cake tin. 7. 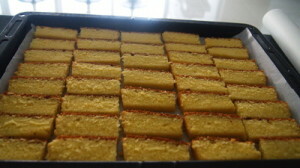 Bake it for 30 minutes or until inserted skewer comes clean. 8. 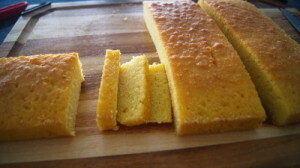 Let the cake cook down and cut the cake into 1 cm thickness. 9. 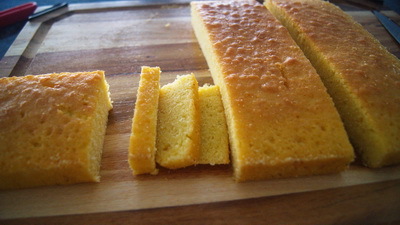 Place cake pieces over baking paper and bake it on each side on 100˚C about 30 minutes or until it becomes crispy. 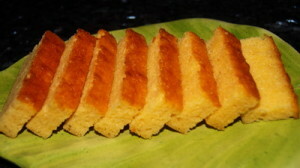 Great website and wonderful recipes! Must try this dry cake soon! I absolutely love your recipes, I do have a request if you could convert “grams” to ounces & cups that will help me a lot. Thank you.